Attaches easily to your cage via screw and cap.. Keeps your bird entertained for hours.. 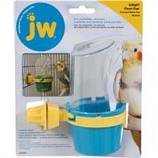 Ideal for parakeets cockatiels and similar sized birds.. Attaches easily to your cage via screw and cap.. .
Clear plastic shield providing an unblocked clear view for birds to feel comfortable placing their heads inside. Extended cup to keep food inside and prevent messes outside of the cage.. Durable and dishwasher safe. 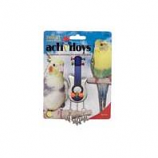 . .
• This Fun Toy Will Engage Your Bird Physically and Mentally. • This Particular Toy Was Designed For Cockatiels, Parakeets, and Similar-Sized Birds. • These Birds Require Exercise and Stimulation To Prevent Boredom and Consequent Destructive Behaviors. • A Treat Toy For Amazons, African Greys, and Similar Sized Parrots. • This Toy Prevents Boredom and Destructive Behavior. • In Their Natural Habitat, Parrots Have To Work and Search For Food. • The Nut Case Gives Them The Opportunity To Do The Same Task. • Constantly Stimulating For Birds, Keeping Them Vibrant and Energetic. • Entertain Your Bird Physically and Mentally With This Fun, Interactive Toy. • For Parakeets, Canaries, Finches and Similar Sized Birds. • Birds Require Exercise and Stimulation Consistently To Stave Off Boredom and Consequent Destructive Behavior. 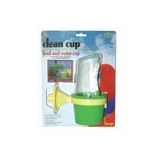 • Ideal For Parakeets, Cockatiels and Similar Sized Birds.